St. Nicholas of Myra was a Christian priest who earned a reputation for kindness and wisdom. He provided for his church members by giving gifts away during the night. He never liked to be seen giving these gifts. He believed that every person should help his friends and neighbors with no expectation of return. 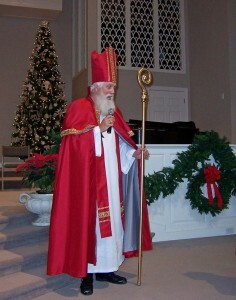 As a portrayer of St. Nicholas, I emphasize that gift giving is to be done without receiving any reward. We should help others because that is what Christ would want us to do. This characterization of St. Nicholas is a religious portrayal. If you would like for St. Nicholas to visit your church or group to explain his origins, please contact me as soon as possible.